I love fantasy. It’s a joy to write, read, watch, and play. And, it’s versatile, too. What other thematic genre allows literally anything you can think of to exist in a world you yourself have created from the ground up? So when I watched the intro sequence to Nihon Falcon’s twelfth entry in the Legend of Heroes series, Trails of Cold Steel II, I was freaking pumped. Sure, it was a pretty stock opening with a typical anime opening theme; stills of the huge cast of characters, and your usual RPG tropes like the ubiquitous airship. But when you’re jamming out to some high-octane rock music watching giant Germanic knight mechs duking it out in the sky, how can you not get excited? Let me first deliver a disclaimer: I have never played the first entry of the Trails of Cold Steel games nor any of the titles in the Legend of Heroes series, but thankfully in the context of this game, that doesn’t really matter. It does an excellent job of familiarizing you with the type of game before the action even starts. Not only does that wicked awesome intro sequence introduce the player to the heavily German- and Scandinavian-inspired world, but throughout the game there are a series of flashbacks that let you know all the vital bits. Here’s my quick synopsis of the story thus far. The series’ main protagonist is Rean Schwarzer, a man in his late teens/early twenties who is the orphan son of Baron Schwarzer of the town of Ymir, and a student at Thors Military Academy. Rean lives in the half fantasy, half steampunk empire of Erebonia, which up until the events of Trails of Cold Steel II was embroiled in something of a cold war against a faction within its own empire, the Noble Alliance. 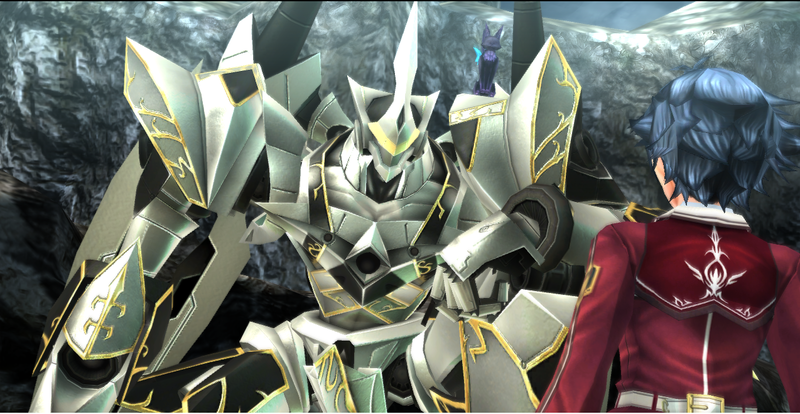 Rean learns that he is a chosen one, meant to pilot a giant fifteen-foot-tall Great Knight called Valimar, and faced off against another Great Knight piloted by a man named Crow Armbrust, who has since sided with the Noble Alliance. Rean realizes too late he is nowhere near strong enough to defeat Crow and is knocked unconscious in the Eisengard Mountains, while the Noble Alliance begin a steady assault on Erebonia. When Rean wakes up, he is greeted by a cat named Celine, who explains she is actually a familiar of a witch named Emma. It’s quite a lot of information gleaned just from a few cutscenes and an exposition-spouting cat, especially for someone with minimal exposure to the series. And indeed, if all of that was too much to swallow all at once (like it was for me) there are plenty of other options to ingest the world’s lore. Players can read all about the events of the first game, find character bios in the pause menu in-game, and, most interestingly, access a log of all conversations between characters, but only those taking place outside of cutscenes. I’m not completely sure of the necessity of the last option, but it could be useful to check back on relationship development between the characters if you needed a refresher after time away. After Rean wakes up from hibernation, he realizes he doesn’t remember everything that had taken place (convenient!) but fortunately he meets Celine the witch-cat, who is more than happy to jog his memory (equally convenient!). The to-be-expected tutorial segment follows as Rean and Celine descend the mountains and back to Rean’s hometown of Ymir. I found this to be a little dense in content considering I am by no means a seasoned JRPG player, so newcomers to the series — or the genre on the whole for that matter — may be a little intimidated at first. In this span of time, Rean re-learns how to fight, which I will discuss in detail later. To summarize the plot direction simply, Rean must gather his friends and allies from the Academy to face off against the Noble Alliance. It seems that they are the only ones who could possibly stop this threat, and Rean is itching to have a rematch with Crow, who has since become cozy with the higher-ups of the Noble Alliance, Duke Cayenne and Rufus Albarea. Some of the colorful cast of characters include Rean’s sister Elise (the white mage archetype of this game), the crown princess of Erebonia and Rean’s love interest Alfin, and Toval of the Bracer Guild, the hard-hitting magician. The characters (and there are very many) seem a little flat, since most just have one defining feature and they don’t really evolve much over the course of the story. Elise is a worrywart, Alfin is cheery and excitable, Toval is headstrong but reserved, et cetera. 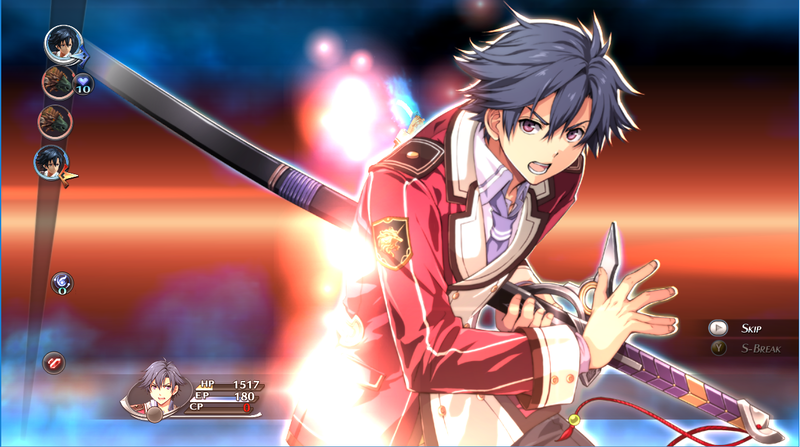 I would put Rean Schwarzer on the above average-level as far as how interesting he is as a JRPG main character. He is a born leader of course, but he also doesn’t take himself too seriously. He is very much the type to put others needs before his own and even consider himself a burden to others when things go poorly (traits I can certainly identify in myself). 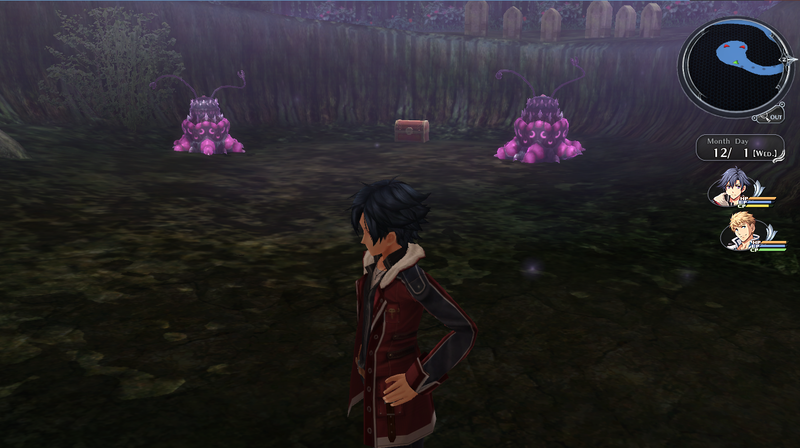 Rean and company proceed to all corners of Erebonia to find Rean’s lost classmates from the academy. Traveling along “spirit paths,” this game’s equivalent of fast traveling, the player will experience six acts and an epilogue in all manner of different locales. So we’ve sat through the intro sequence and its subsequent exposition cutscenes and gotten super excited for the grand adventure that’s about to take place. Now what? Well to be frank, a bit of a letdown. 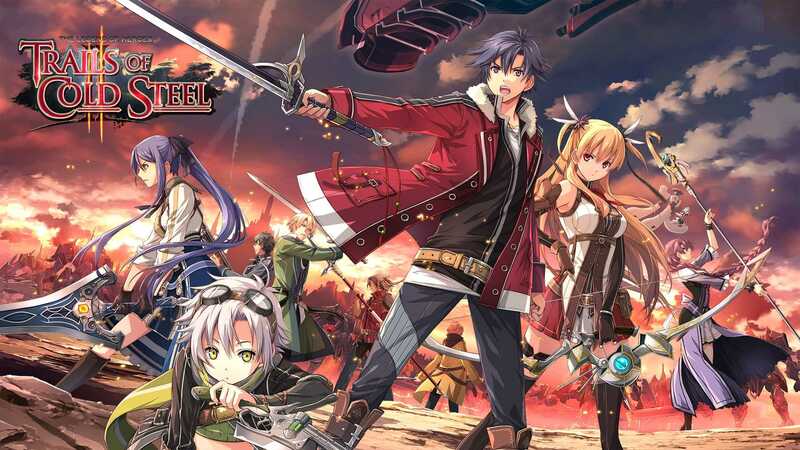 When I fired up Trails of Cold Steel II, I was expecting a fast-paced action RPG with some high fantasy and steampunk elements, ever-changing scenery, and a lot of interesting and noteworthy characters. Unfortunately, the world itself is completely linear with very little deviation. But I won’t get ahead of myself. 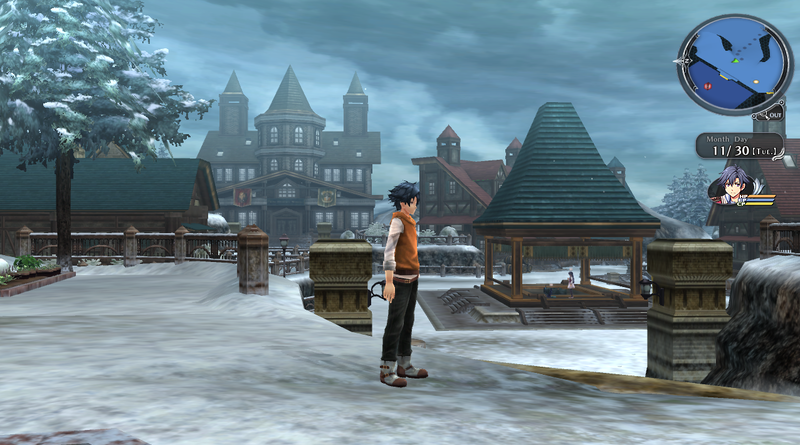 Trails of Cold Steel II is pretty. The scenery, while a little bleak in the snowy mountains of Eisengard and Ymir in the beginning soon become a lot more interesting. Descending from the starting area, the player experiences such locales as Lunaria Nature Park, a large forest full of mystical magics, or the sprawling vermilion capital city of Heimdallr featuring vibrantly dressed NPCs. Not only is the environment varied and well designed, but both the main and secondary characters follow suit. I liked the design of most if not all the characters, from Rean’s stark red modification of his Academy uniform to the beautiful cerulean scheme of the witch Vita Clotilde. Better still, the characters change their appearance from time to time, which is very nice after years of games with singular costumes that characters wear in bitter cold, blazing heat, underwater, and for every formal occasion. The game is fully voice acted as well, and while not all dialogue is spoken, it’s enough that you get a sense of every character’s defined personality. While not the most memorable cast, it does the job well enough. While the character models look fine, the animations leave a lot to be desired. The models do all the expected animations like walking, basic poses, even interacting with other models, but all of this looks decidedly last gen. The original Japanese release of Trails of Cold Steel II came out on September 25, 2014, and at points felt like it could have been on the GameCube. Additionally, I find that as I travel the free-roam parts of the games, places that I think I should be able to access are blocked by invisible walls. And places that I expect I could just waltz up to (a small ledge next to a set of steps, for example) stop me dead in my tracks. Trails is a very linear game; you only go exactly where it wants you to go and nowhere it doesn’t. While it may at points play like it came out a decade ago, there are some nice features which are a welcome sight in 2018. Seemingly minor things like the ability to save at any point in the game, which honestly should be common practice at this point. Additionally, when approaching a boss fight, there will always be a pedestal where the party can rest and heal up. For a game that can become fairly complex to the point of convolution, a saving grace is that the menus are easy to navigate and are intuitive enough to understand the many complexities the game has to offer. The biggest gripe I have with this game is the number of cutscenes. There are far too many. And not only that, but each one is long; longer than I expect every time. Often when I needed to put the game down for any reason it was in the middle of an exceptionally lengthy cutscene that had important information vital to the plot. I had skip through these lines and lines of dialogue at light speed just to save. It was especially agonizing when talking to minor characters. I can remember one instance in particular when I spoke to the Baron’s dog expecting a simple “woof,” but instead Rean had an entire one-sided conversation with him! Ah, turn-based battle systems; a cornerstone of JRPGs. As the subtitle suggests, I was actually quite impressed with the way battles are handled in Trails of Cold Steel II. They don’t waste your time with a lot of fluff and are relatively intuitive, but there are still some major pros and cons. A major exception to this rule are the boss fights, which are absolutely too long; I wasn’t sure if each were supposed to be scripted or not, as I felt a sense of hopelessness nearly every time. As the player moves about the world in places other than towns, they will immediately notice that battles are not random. In fact, they’re strategically placed about the map, which is a detail I love. You have the option of avoiding many enemies if you wish, but some are unavoidable. You can enter battles normally, get a first strike, or have the foe get a first strike on you, in typical fashion. What I love most about enemy encounters though is how none of them feel unnecessary. If you avoid every possible enemy, you only get between two and five fights total in an areas. Every other enemy on the map is guarding a treasure chest containing valuable loot, but may be more challenging. This means if you feel like taking on stronger foes, the rewards are not only greater but tangible, and that is an awesome design choice. Now let’s get to the nitty-gritty of battling in Trails of Cold Steel II. First, you have your base battling mechanics: several characters taking turns attacking several enemies. Everyone can attack, use magic, use an item, or run about the field of battle. However, there are numerous complexities housed within these decisions. At the center are objects called Orbments, which define what characters can do in battle aside from regular attacks with weaponry. Orbments allow each character to perform Arts (magical attacks) and Crafts (complex physical attacks) using a Master Quartz which decides the form of attacks that will take place (cure magic, player enhancements, damage dealing, etc.). The Master Quartz connects in different ways to sepiths; stones the player synthesizes after collecting materials en masse throughout the game. Sepiths have different elements, and when placed strategically around the Master Quartz, they create new Arts and Crafts for the player to use. Each character only has a finite amount of CP and EP to exhaust, and each Art and Craft takes up a different amount, so the player must choose wisely. Arts and Crafts has certain effectiveness and weaknesses against enemies, who in turn each have their own elements. I liken this mechanic to Pokémon types, but with only a handful to keep track of rather than seventeen. If a super-effective Art or Craft is used on an enemy, they become unbalanced, allowing for characters to use a powerful S-breaks as interrupts and cost a lot of energy to perform, or use link combat, in which two characters team up to attack one or more enemies. 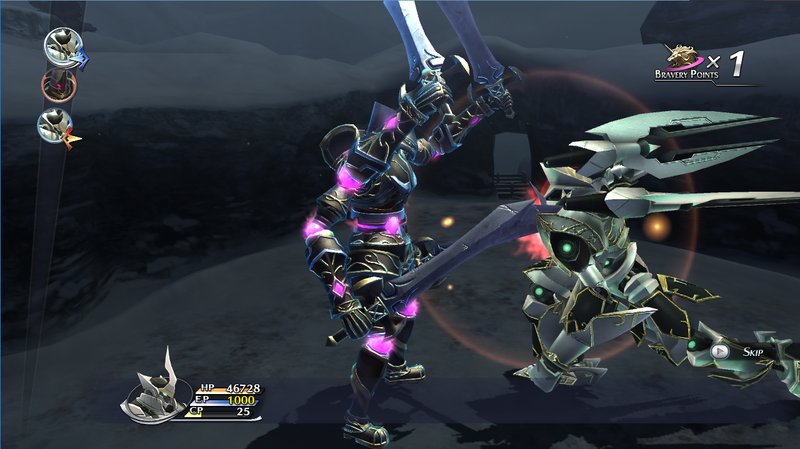 One last facet that completely throws out all these mechanics is the rare instance when Rean enters his Great Knight Valimar and fights against other mechs. While really fun to watch, the gameplay is no simpler than trading blows and occasionally using more powerful attacks. Not nearly as exciting as I hoped it would be. During my playthrough, I initially found all this complexity extremely overwhelming, which made me put the game down for several days. However, once I got in the swing of things, the complexity slowly started to make sense. I liken this learning curve to gaining experience in fighting games. You start out by trying every combination of buttons you can to see what each thing does, then get too confused and just button mash, then becoming more brave and trying some combos to see what works and what doesn’t, and finally mastering the combos and being able to time your attacks and know what can be used against which enemy. I want to lastly touch on the presentation of battles. 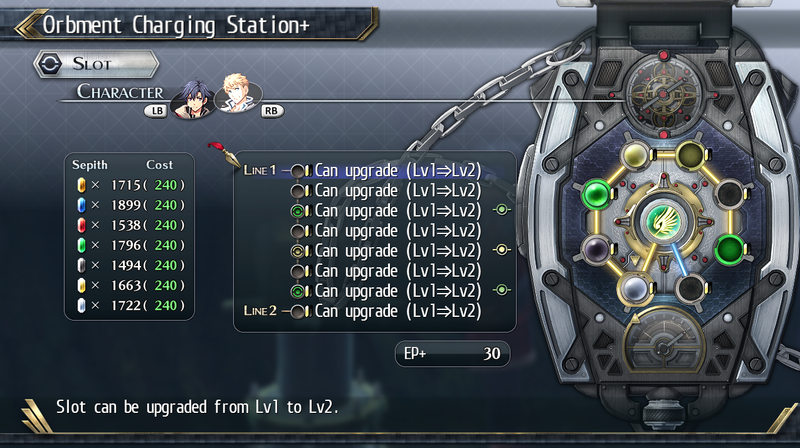 This is probably Trails of Cold Steel II’s strongest feature. Each attack, Art, Craft, S-break, and link is artfully crafted (see what I did there?) and implements colorful sights and sounds, and even throws in some 2D stills to show that when you’re hitting hard, you can feel it. After a while watching every single animation grows a bit stale, but fortunately, you can skip every battle animation in the game. I cannot stress how wonderful this is—sometimes I’m in the mood to watch the beautiful strikes and magicks the characters and enemies perform, but other times I just want to blow through a battle and move on. And I’m in complete control the entire time. 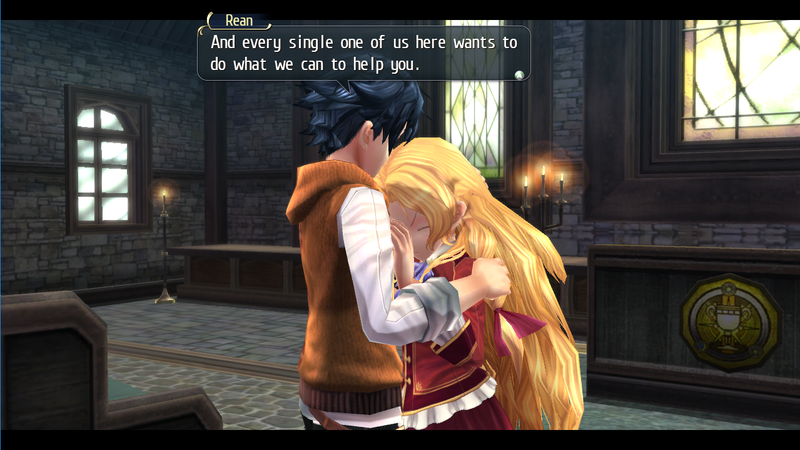 Trails of Cold Steel II has a lot going on in it, and I mean a lot. With around 57 hours of gameplay (not including going for 100% completion), this RPG is lengthy, and rightly so. With the numerous battles, secrets, mini-games, and agonizingly long cutscenes, the player will find there is much to do and not a lot of opportunity to digest it all. Personally, I disliked how slow progress was in the game, and how every conversation felt like a chore to the point that I almost stopped caring about the vital information I was receiving. That being said, I think the game’s polish and presentation definitely redeemed its pacing. I find it an interesting choice on the developers’ part to divide this story the way they did. Trails of Cold Steel II is the second in an arc of three — soon to become four — games, so under normal thematic circumstances I’d expect each entry to have its own story. Based on the transition between games one and two, that isn’t the case. According to what I could tell, the first game only introduces Valimar near the very end. And, if I am to believe the intro sequence and the way the lore is presented, the Great Knights are very central to this story. That means that Trails of Cold Steel is more of an episodic story, rather than a set of four games that each have their own self-contained plot. Is this a good move or not? I feel it’s certainly a change of pace compared to other RPGs, but it remains to be seen if I personally care for it or not. I’d probably have to play the other entries first. Killer intro, intense battles, impressive presentation, and an intriguing world with deep lore is ultimately overshadowed by the agony of sitting through endless cutscenes and trying to understand the plethora of content needed to complete the game.